Of all the wild animals in the United States, rabbits are one of the most common. 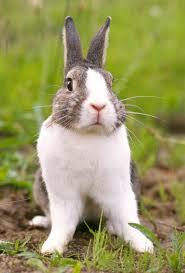 Cottontail rabbits, with their soft brown fur and white fluffy tails, are found in almost every state. They live in woods, grassy fields, near farms and even in neighborhoods. All About Rabbits: Of all the wild animals in the United States, rabbits are one of the most common. Rabbits and hares aren’t the same thing. 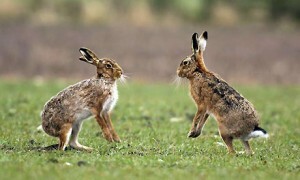 Hares have longer ears than rabbits and longer legs. They don’t live in underground dens. Hare babies are born with hair; rabbit babies are born naked. 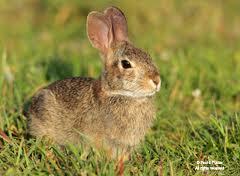 Cottontail rabbits, with their soft brown fur and white fluffy tails, are found in almost every state. 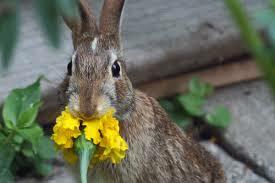 In the summer, rabbits eat grass, wild strawberries, garden vegetables and some flowers. In the winter, they survive on woody stems and even the bark of some trees. Rabbits are most active at sunset and at dawn. During the day, they hide under bushes, logs or even old sheds. Remember Peter the Rabbit hiding from Mr. McGregor? When rabbits are scared, they freeze and scrunch down to hide. Rabbits build underground burrows to live in. The burrows have tunnels and a large room. Rabbits start having babies when they’re one year old. Rabbits can have as many as 25 babies in one year. Wow! That’s a busy mama! Rabbits make nests for their babies under bushes or sheds or even old compost piles. Be careful when you’re digging around in the spring. You just might find a rabbit’s nest. Baby rabbits stay with their moms for only two weeks. Then they fend for themselves. Hares have longer ears than rabbits and longer legs. 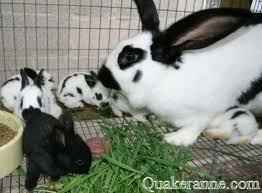 Rabbits can have as many as 25 babies in one year. A video about wild rabbit behaviors. Question: How do rabbits escape predators? Answer: Sometimes they hide in the grass, or they run in a zig zag pattern. Rabbits are constantly on the lookout for trouble. Question: Do orphaned baby rabbits need help? Answer: Mother rabbits leave their babies during the day so the babies probably aren’t really orphaned. Stretch a piece of string over the nest and check it again the next day. If the string was moved, mom is still around. If you have to chase a baby rabbit to catch it, it is old enough to fend for itself. Enjoyed the Easy Science for Kids Website all about Rabbits info? Take the FREE & fun all about Rabbits quiz and download FREE Rabbits worksheet for kids. For lengthy info click here. Declan, Tobin. " Fun Rabbit Facts for Kids ." Easy Science for Kids, Apr 2019. Web. 21 Apr 2019. < https://easyscienceforkids.com/all-about-rabbits/ >.